Oprah and her minions must read my blog because a little bird told me that her next book club selection is a book that also happens to be on my reading queue. The Heart Is a Lonely Hunter is a somewhat forgotten classic by Carson McCullers. From what I’ve heard, the book resembles To Kill a Mockingbird and several other works of fiction by Southern women authors. And now it will be a bestseller. If you are one of those people who gets annoyed about the Oprah logo, hurry and get one before they run out of unbesmirched copies. C. Max Magee created The Millions and is its publisher. He and his family live in New Jersey. I’ve got an affinity for diagrams. I find the books of Edward Tufte fascinating, and my interest in such things extends even to the “infographics” contained in most newspapers. 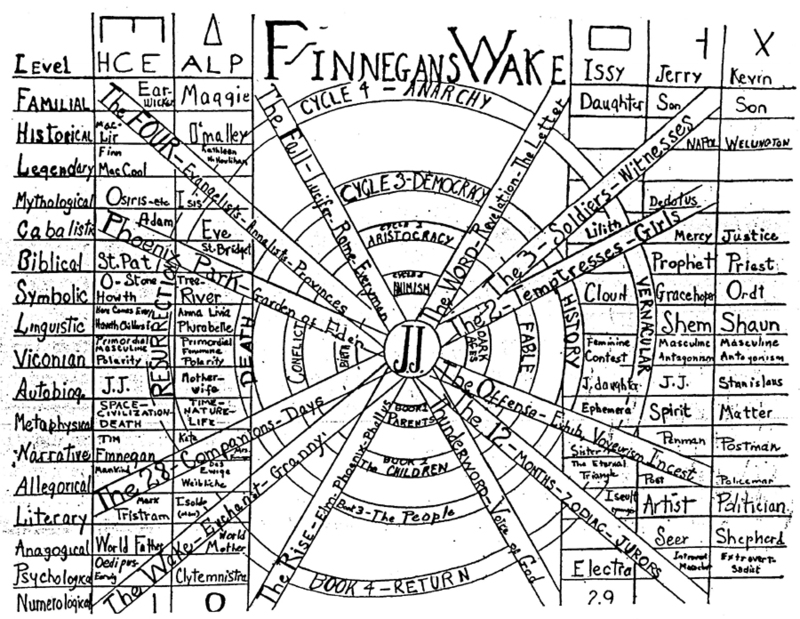 I like the idea of distilling something complex down to a visual representation.And what is more complex than Finnegans Wake, which was the subject of a dense and mysterious-looking diagram from the book Vision in Motion by Laszlo Moholy-Nagy. Richard Kostelanetz highlights the diagram in an essay about Moholy-Nagy, about whom he writes “Need it be said that no other modern artist wrote as well about literature?”Kostelanetz goes on to write “What Moholy established in Vision in Motion was a model of writing about all the arts as a single entity, to be called art, whose branches (literature, painting, etc.) were merely false conveniences conducive to specialization and isolation.” (via)This multi-discipline approach would seem to be of particular use in our multimedia world. It’s brings to mind another creative attempt to parse a complex work of literature via non-traditional means: the Pynchon wiki. There are probably two cardinal rules of blogging; that is, there are two things that a blogger must do to have a fully realized blog within the mass that is the blogosphere. One, the blogger should post relatively frequently and consistently, several times a week lets say. Second, a blogger should link to other blogs. I’ve been reasonably successful at the former, but inadequate at the latter. But I can assure you, this has been out of laziness and not by design. When I started this blog about 18 months ago, it didn’t occur to me that there might be other blogs about books out there, but indeed there were, and new ones crop up all the time. It occurred to me recently that the readers of my blog, being book fans, might like to know about the litblogs that are out there. So here are some of my favorites. Add them to your bookmarks, read them. Enjoy their daily nourishment:Beatrice — It’s not what you think. Beatrice isn’t an old woman with a beehive hairdo, it’s blog run by Ron Hogan. Beatrice is probably my favorite of all the litblogs. Hogan touches on all the big stories with humor, and he often has his own insights to add. Plus, and this is a very big plus, he has an unbelievable archive of interviews he’s conducted with literary luminaries over the years.The Elegant Variation — I met Mark Sarvas once at the bookstore I worked at in Los Angeles. He was there for a sparsely attended reading, by whom I can’t recall, and we got to chatting. Like first time fathers, we talked about our, at the time, brand new blogs. And while I would continue to plug away in my fashion, Sarvas quite rapidly put together one of the most widely read litblogs out there. If you want to stay on top of the lit world and the litblog world, the Elegant Variation is essential.Golden Rule Jones — When I moved to Chicago, my goal was to have the city’s second-best litblog. His listings of local readings are indispensable, and his understanding of the city’s literary scene is deep. Still, Golden Rule Jones is a quieter redoubt, and Jones isn’t afraid to present his readers with the occasional poetic interlude. If you live in Chicago and love books, you might as well make Golden Rule Jones your homepage.The Literary Saloon — The Saloon is a very newsy sort of litblog with a British bent. It’s great place to keep up on Booker gossip and the like. n.b. The Saloon is attached to one of the best book review sites on the web: The Complete ReviewMaud Newton — Maud Newton is the grande dame of litbloggers. Her tremendously popular blog lays it all out on the table from her literary loves to her daily trials and tribulations. Something about Maud makes you really want to root for her. Go Maud!Rake’s Progress — A relative newcomer, Rake’s Progress consists of terrific links and off the cuff literary analysis delivered with a well-developed sense of irony and humor.Confessions of an Idiosyncratic Mind — Sarah Weinman is professional book reviewer who has been kind enough to share her talents with the blogosphere. Her background is in crime fiction, but she turns her journalist’s eye on all aspects of the literary world. She’s a real pro.GalleyCat — An outgrowth of the publishing networking site, Media Bistro, GalleyCat is a newsy spot that will keep you up to date on all the latest stories in the publishing world and in litblog land. If you just have time to read one blog a day, GalleyCat will keep you in the loop.Bookdwarf — Bookdwarf is a blog that’s close to my heart because it has a lot in common with The Millions. Bookdwarf works at a great independent bookstore, just like I used too. And just like me she can’t help but spread all that bookstore knowledge far and wide.Tingle Alley — Tingle Alley is a blog by a writer who happens to be, as all good writers should be, an avid reader. She shares her thoughts on the latest book news, on the books she reads, and on the progress of her novel.Waterboro Library Blog — Lots of libraries have a web presence, but none of them blog like the folks in Waterboro, Maine. In the helpful spirit of librarians everywhere, the Waterboro Blog is a great source for important book news. It’s a real public service.Conversational Reading — Scott Esposito’s blog is a real readers’ blog. He eschews the gossipy book news and sticks to discussing reading, posting long, insightful pieces about his reading experience. Esposito also reviews books for various publications.Casa Malaprop — Don Lindgren is a rare book dealer who has an eye for interesting links, (and, presumably, rare books).languagehat.com — I’ve mentioned languagehat on this blog before. Its not really a litblog per se, but languagehat is so chock full of interesting linguistic information that it really shouldn’t be missed. After reading languagehat, you will be tempted to become an amateur linguist yourself.Old Hag — Jimmy at Old Hag is a funny guy. He finds the humor in the book world, in trying to be a writer, in blogging about all this stuff. He’ll make you laugh. (Lizzie’s funny, too. )So that’s it for now. I’ve probably forgotten to mention many worthy litblogs and misrepresented some of the ones I did mention. The point is, there’s lots of great blogs about books out there, and if you only read mine you’re missing out. So check these guys out; you won’t be disappointed. This week is turning out to be a mini-family reunion for me. My parents and two of my brothers are in town as are some aunts and uncles and cousins. Yesterday evening at a family barbecue near Venice Beach I fell into a conversation with my aunt and uncle about the reading habits of my young cousin, Tim, who is 10. He’s a very precocious reader and has finished off nearly all of the highly recommended children’s series that are out there right now: Harry Potter, Lemony Snicket, and Brian Jacques’ Redwall Series (I recommended Phillip Pullman’s His Dark Materials Trilogy since he hasn’t gotten to that yet.) The thing is, there’s a limited amount of high quality young adult fiction out there, so what do you do if your kid has read it all? Since I started working at the bookstore I have occasionally been posed this question by parents. It’s actually a crucial moment in the life of a young a reader, the point where they could very easily lose some interest reading because they have read all the kids’ books and aren’t allowed to read adult books. What folks sometimes forget is that there are quite a few books that, though they are shelved in the adult fiction section, are perfect books to help segue strong, young readers into the wider world that lies beyond the young adult section. Some people call these books classics, but they are perfect for challenging kids and keeping them interested in reading: The Adventures of Huckleberry Finn, The Time Machine, 20,000 Leagues Under the Sea, and Journey to the Center of the Earth, to name just a few. I would also recommend that these children read the books in their original forms, not the abridged versions. I remember reading abridged versions of various classics when I was younger, and I think lots of other folks do as well, but looking back it just doesn’t seem necessary. In fact, as an eleven or twelve year old, I learned a lot of complex things about the world around me from the books I read, and these important details, the harsh language in Huck Finn, for example, seem to be just the things that are excised in order to create the kid friendly versions. We challenge kids in many aspects of their lives, why not challenge them to explore the big questions that arise from reading the classics. I hope that the children’s book industry continues to move in this direction, and a lot of the intelligent and challenging kids’ books that are out there indicate that it will. On the other hand, my friend Edan pointed out to me the other day the upcoming release of a “Student Edition” of Yann Martel’s international bestseller Life of Pi, from which, one can assume, the editors have removed anything that might distress, and therefore challenge, a young reader. Here’s hoping that this doesn’t kick off a new trend. Today at the bookstore I met a young writer named Julie Orringer. She talked about Dave Eggers and Heidi Julavits and 826 Valencia, an exciting bunch. She mentioned that her first book, a collection of short stories called How to Breathe Underwater, will come out this Fall. A quick look at the website of one of the big book distributors confirmed that Knopf is expecting a strong debut. After I got home I did a little Google and discovered that a few of her stories are on the web. She has won several awards and fellowships and looks to be a real rising star. My favorite of the three stories that I read today originally appeared in Ploughshares. It’s called Pilgrims. I most enjoyed the ease with which she tells a story full of the troubles of adults from the point of view of children. I also read Care from the Barcelona Review and Note to Sixth-Grade Self from the Paris Review. I enjoyed these stories as well, though I felt that Note to Sixth-Grade Self was unecessarily clever. Keep an eye out for her. She seems likely to do impressive things. The best part about The New Yorker’s summer flash fiction series is that The New Yorker did a summer flash fiction series. The worst part about The New Yorker’s summer flash fiction series is that if you blinked you missed it. Some news stories that caught my this morning:People come into the bookstore all the time to make lists of books that they want to read. Then they head over to the library to try to find them. Every once in a while a doleful customer will remark that the book that he or she wants to read has an interminable waiting list. From these folks and from personal experience I know that it can be next to impossible to borrow a bestseller from the library. What I didn’t know is that adding your name to those waiting lists inspires libraries to buy more books. As this article describes, a waiting list of 296 people prompted the Ann Arbor and Ypsilanti, Michigan library system to buy 96 copies of The Da Vinci Code. So, signing up for library waiting lists is a way to give a boost to the book industry, even if you never spend a buck.Amazon’s UK site has launched an interesting venue called the Authors’ Lounge. The Authors’ Lounge features video clips of authors talking about their books. Right now they’ve got John Le Carre talking about his new book Absolute Friends as well as several other folks.